Since dogs learn that when the doorbell rings, and they run around barking, squealing, growling, and jumping off the walls, they will be rewarded with visitors to jump on, it is important to teach your dog the behavior you want him to do rather than what NOT to do. I highly recommend training a quiet sit or down stay when visitors ring the doorbell and that the door will not open until your dog is sitting peacefully waiting for his reward- attention from people coming through the door. First, train the sit and down stay without and then with distractions in every room of your house. Work your way up to a 2-minute ‘stay’ in the living room and backyard, and then start asking for a stay at the door and the front gate before you go outside for your evening walk. Do not open the door until your dog is sitting nicely in a sit stay. 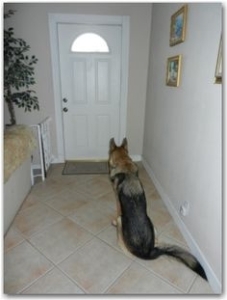 If your dog gets up as you open the door, immediately shut the door and redirect your dog back into a sit stay. (The best natural consequence there is for getting up as you open the door is you shutting the door so the dog cannot go outside.) Say ‘stay’ and attempt to open the door again. Practice this every time you go out an entrance, and once your dog stays as you open and then walk through the door, say ‘Free’ or ‘okay’ from the other side of the threshold. ALWAYS give your dog a release word at the end of the stay. Have plenty of tasty treats by the front door or in your pocket. When the doorbell rings, walk your dog to the door, and ask for a sit or down stay far enough away so that you can open the door without it touching your dog. Do not attempt to open the door until your dog has stopped barking and is sitting somewhat calmly. If your dog gets up when you start to open the door, shut the door! Ask your dog to sit and stay again and try to open the door. Every time you start to open the door and your dog gets up, shut the door. This will teach your dog that he must stay sitting in order for mom or dad to completely open the door, and for the really fun people to come through and pay attention to him. It works fabulously! Your guests may have to wait a minute or two, but your dog will catch on quickly. You can even leave some treats out on the front step so your guests can reward your dog once they come through the door, but only if he is sitting quietly and not jumping or barking. It may also help to start desensitizing your dog to the doorbell. Start by ringing the doorbell many times a day for no reason. When you go out to get the mail, when you come home from work, when you come in from gardening, when you come in from your evening walk, while your dog is eating, etc, so your dog will learn that the sound of the doorbell ringing doesn’t necessarily mean someone new is coming through the door. You can even tape-record the sound of the doorbell and play it a hundred times a day. Or better yet, get a remote doorbell from Home Depot and ding it all the time! It won’t take long for your dog to learn the doorbell isn’t that exciting after all. • Take your dog on a walk and/or play fetch outside to tire your dog out before guests come over. • Have your dog wear a collar and leash when you are first working on stay by the door. • Tell guests to ask your dog to sit before they give him attention. (You can give them treats). • Fill a Kong or other stuff able toy and give it to your dog when guests first arrive. I use my dog’s food and peanut butter and freeze it. You can also use treats and plain yogurt. 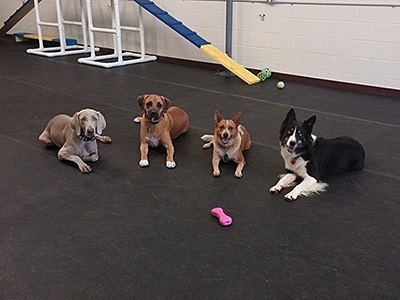 If you need help or advice with dog behavior such as barking, pulling on the leash, jumping on people, aggression or fearfulness, please give us a call. We offer free evaluations (at your home or our facility) and affordable and effective solutions to all of your dog training needs. We can be reached at 803.210.9380 or info@perfectpetdog.com.